Early Success. 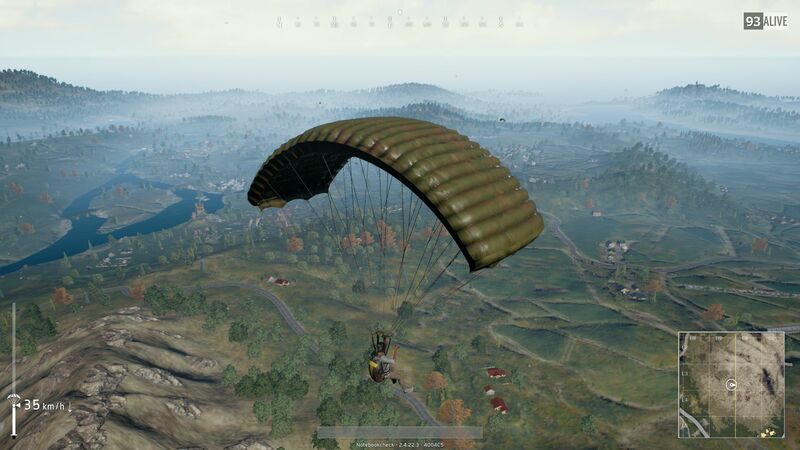 Although Playerunknown's Battlegrounds (abbreviated PUBG) is still in a very early stage of development, the Battle Royale shooter is already very popular. 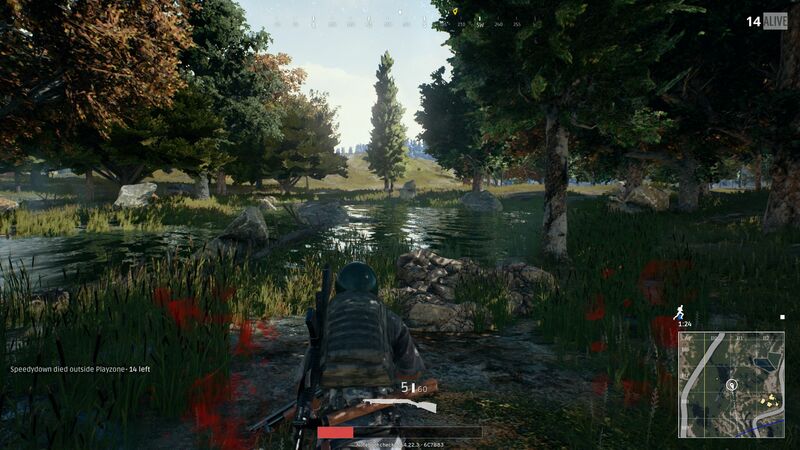 We also plunged into the fight for survival and analyzed the game's performance for this article. 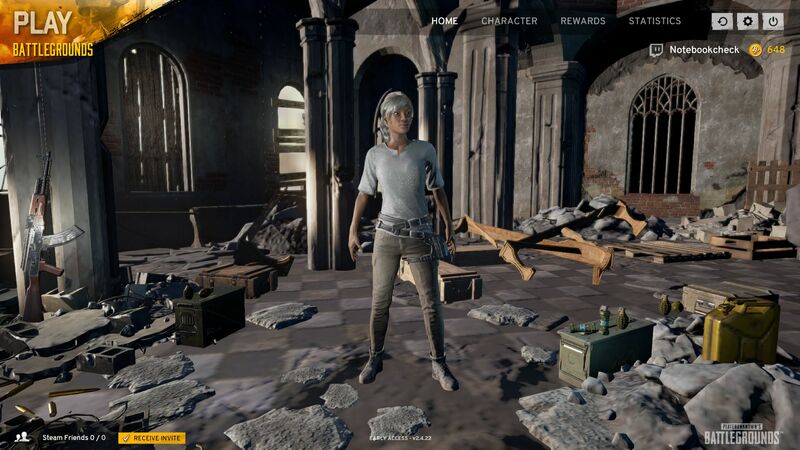 While most shooter games are geared toward mindless action and - if at all - only demand little strategy, PUBG presents itself as a sophisticated survival experience with many surprises and suspenseful moments. 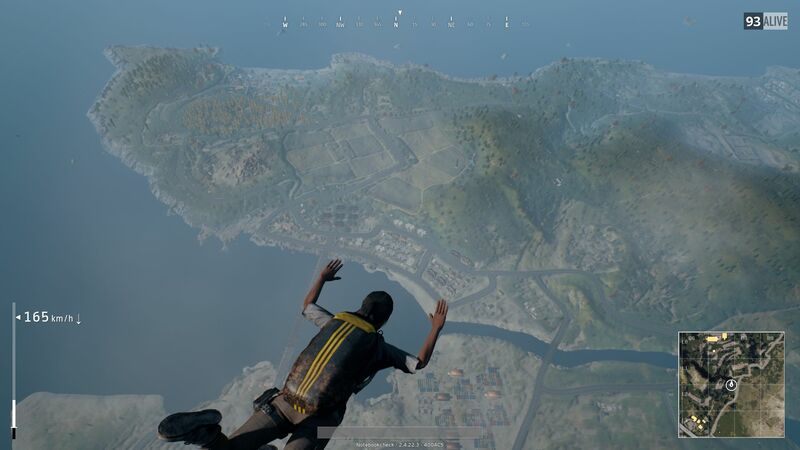 The basic idea is explained quickly: Up to 100 players jump out of a plane onto a deserted island (at a self-ordained time), and they have to struggle through zones that get increasingly tighter. 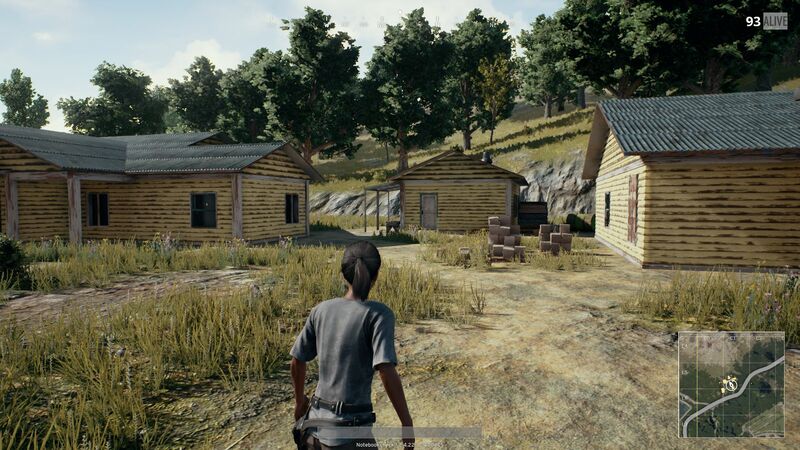 To defend and protect themselves against other players, diverse objects, such as weapons, weapon attachments, armor and other upgrades can be looted in the many houses, huts, and factory buildings on the island. 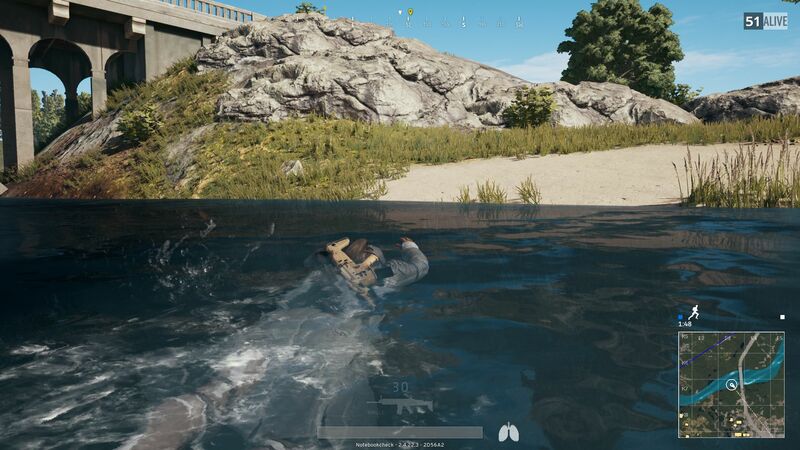 The pleasant thing about PUBG is that it allows creating a very individual gaming style. 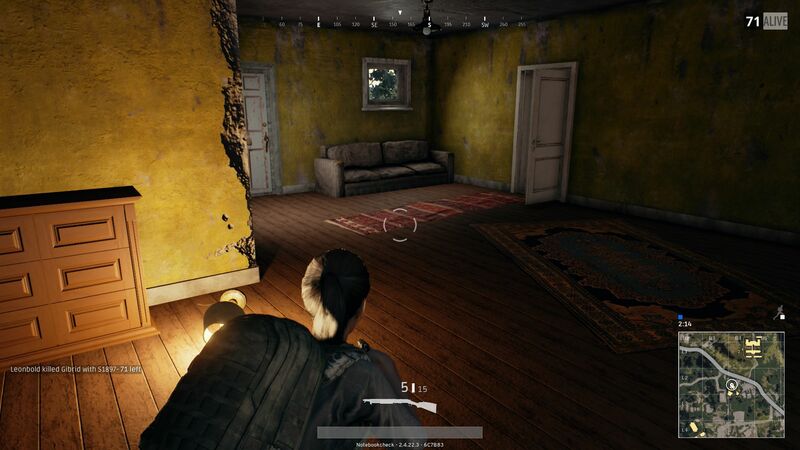 Although the title can be played as a tough shooter experience, stealth fans who prefer to progress slowly through the gigantic map and mostly avoid battles also have a good, if not better chance to take a top position. 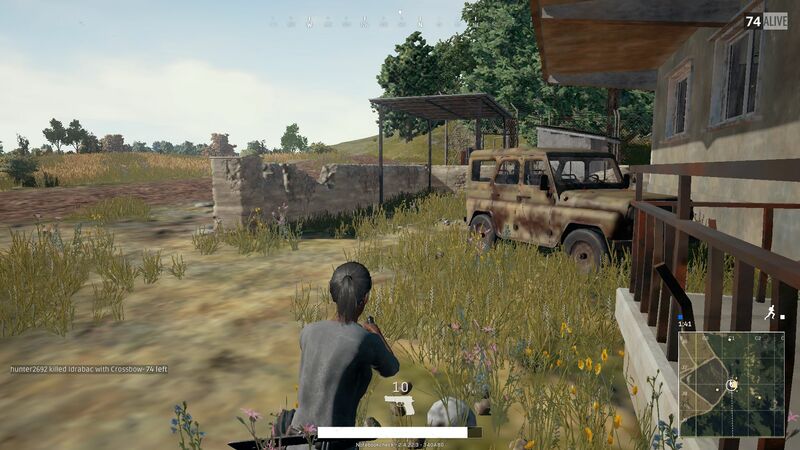 The deadly energy field that decreases the battlefield every few minutes adds tempo to the game and even forces notorious campers to move forward at some point. 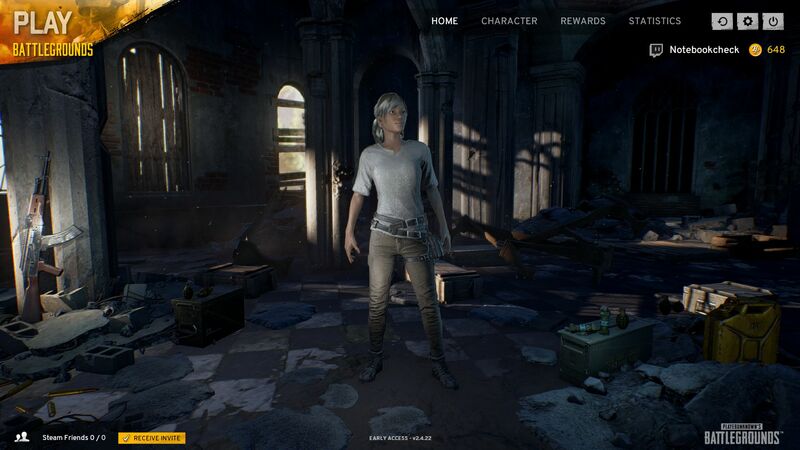 Of course, the early access status of PUBG is soon noticed in many aspects. 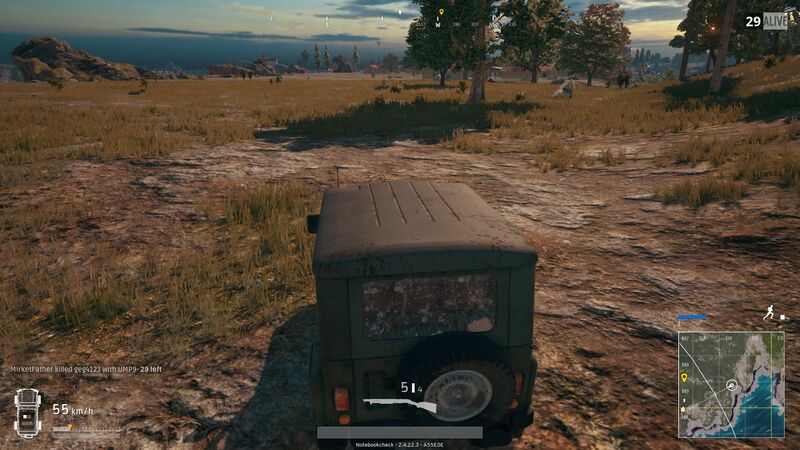 Thus, we not only discovered graphics errors and a strange collision behavior during almost 20 test rounds, but we also found other bugs (lying low suddenly did not function, objects in the air, etc.) that were largely tolerable and only lessened the gaming fun marginally. The same is true for the problems that occurred in the main menu (incorrect menu scaling, connection loss, etc.). Despite the named shortcomings, PUBG makes a considerably more developed impression than the badly programmed and optimized Day-Z at the time. 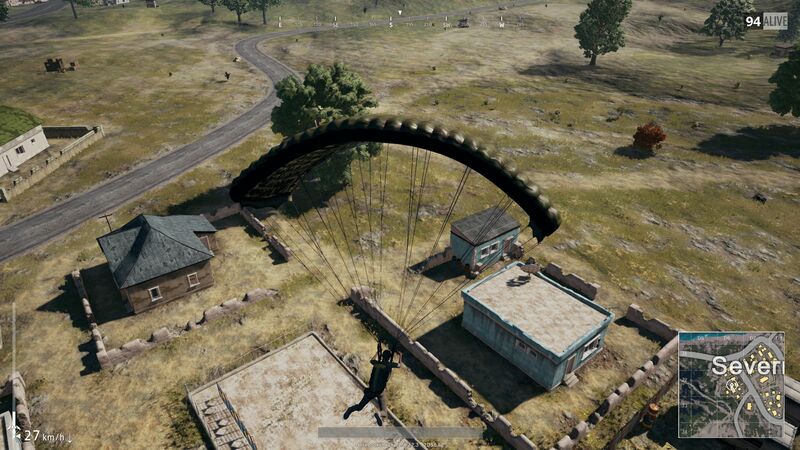 For example, we were never thrown back into the lobby during a mission. We only experienced a total crash once while changing the settings. 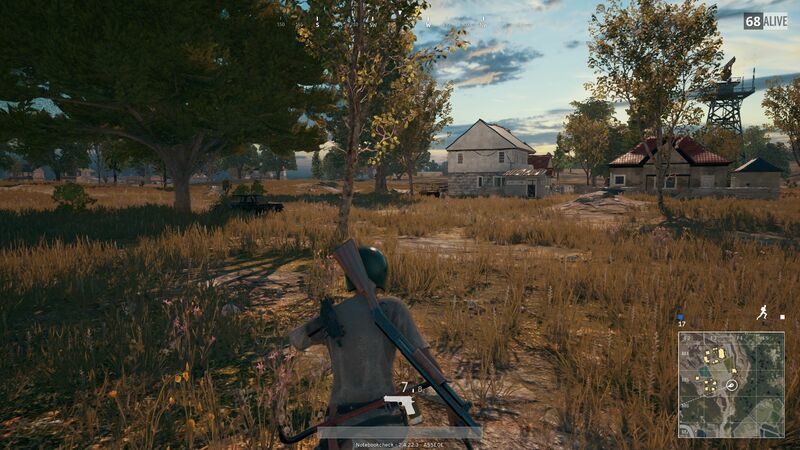 Talking about settings: PUBG offers a clearly arranged graphics menu that has buttons for resolution, screen mode, and brightness in the upper area. Diverse controls for details are further below this and range from anti-aliasing (not specified in detail) up to View Distance. An optional Motion Blur is also present. We left the default rate at 100 in the Screen Scale option for all tests. The five presets that allow adapting the total quality in one step, and which also served as the basis for our benchmarks, are particularly handy. 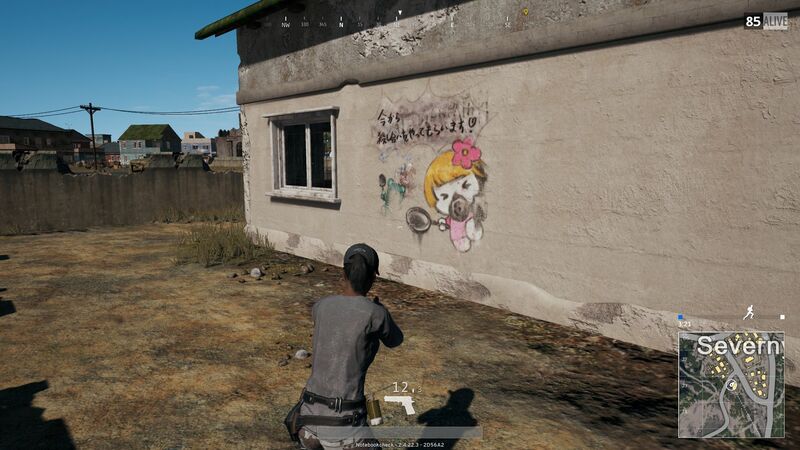 The graphics make a mixed impression. 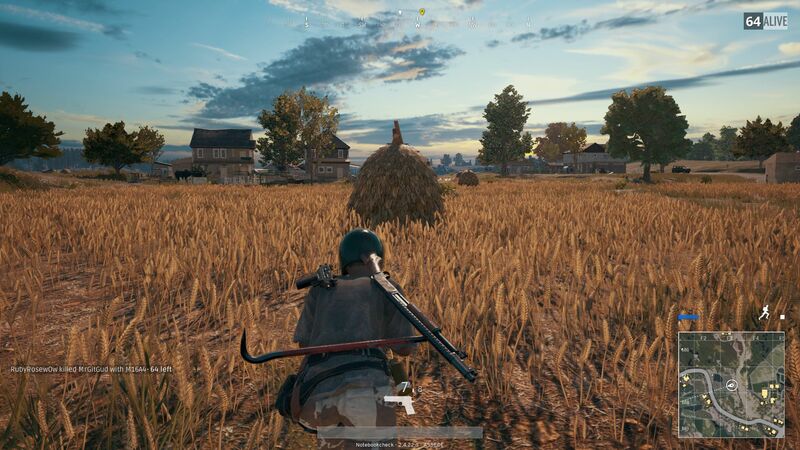 On the positive side, we had a dense vegetation in the near field (fades out at some point), and a far range of view - alongside the different times of day and weather conditions, this creates a pretty lighting atmosphere. 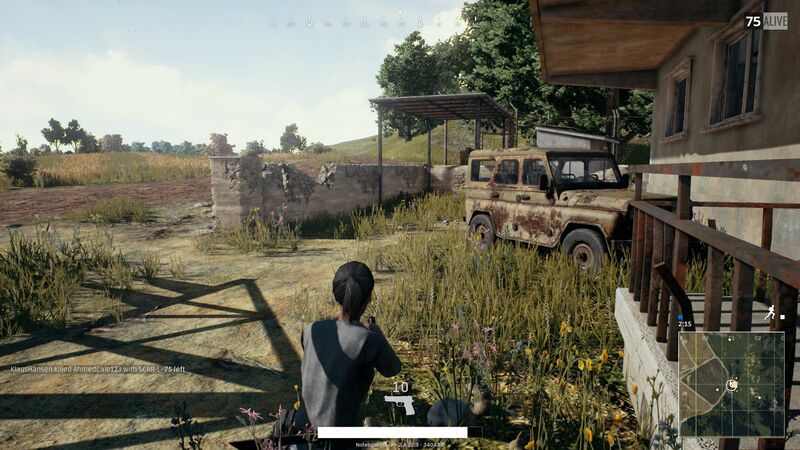 The Bluehole developers could improve the texture quality, which is - with exception of the detailed character and equipment models - so low in some places that it reminded us of placeholders. Many objects also flickered despite anti-aliasing. Incomprehensible performance drops additionally make it difficult to recommend hardware. 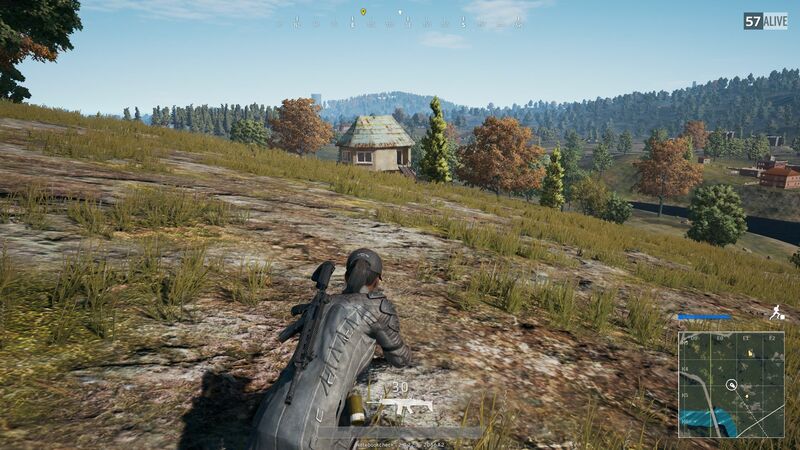 The incorporated limit does not allow more than 144 FPS. 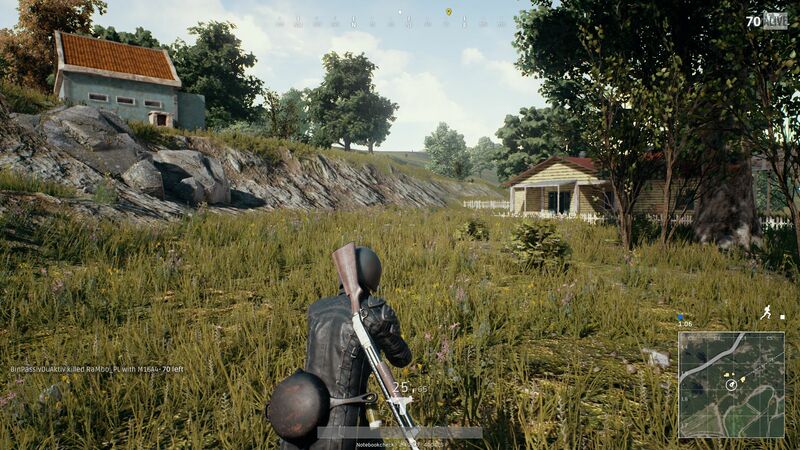 Technically, PUBG is based on the Unreal Engine 4 that, however, first looks fairly good in medium to high settings. The image is relatively blurry and loses atmosphere in minimum to low details. The sound system proves to be worthy of reference. Shots, steps or engine noises closing in or moving away often cause goose bumps especially when hiding poorly armed in a house. 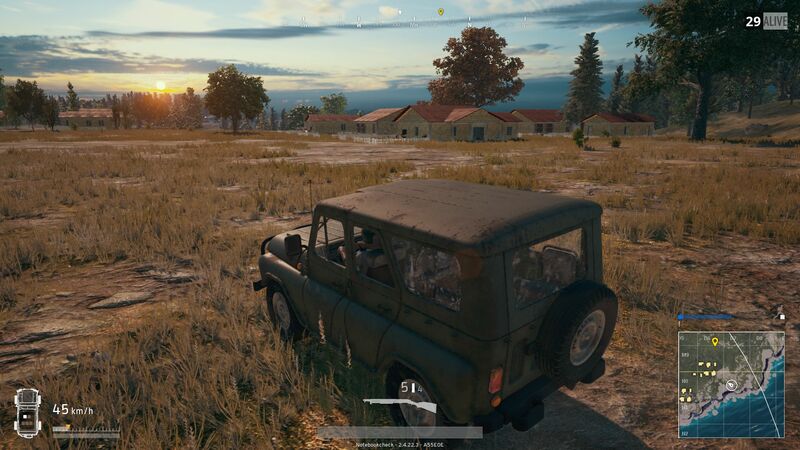 The game's low capacity also has to be praised. 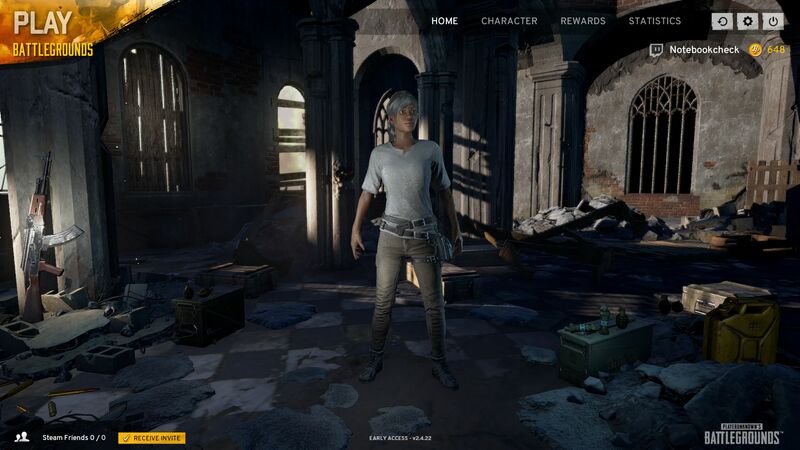 PUBG pleasingly reserves only little space on the hard drive with approximately 7 GB. 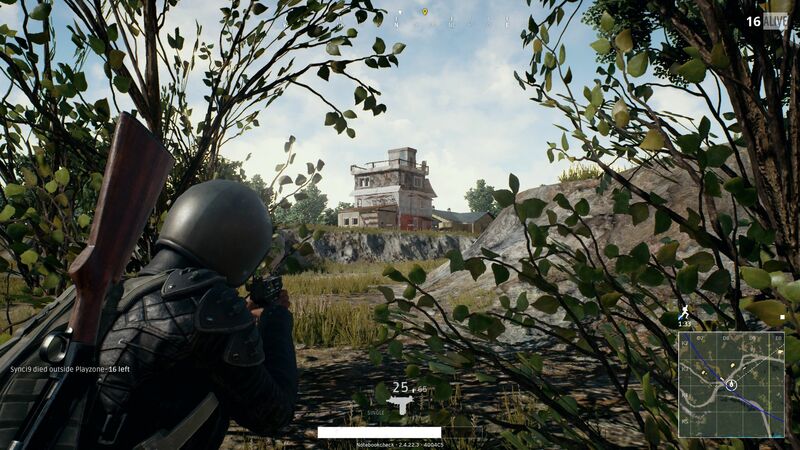 As mentioned, the Battle Royale shooter's performance tends to fluctuate, making it difficult to find a suitable benchmark sequence. 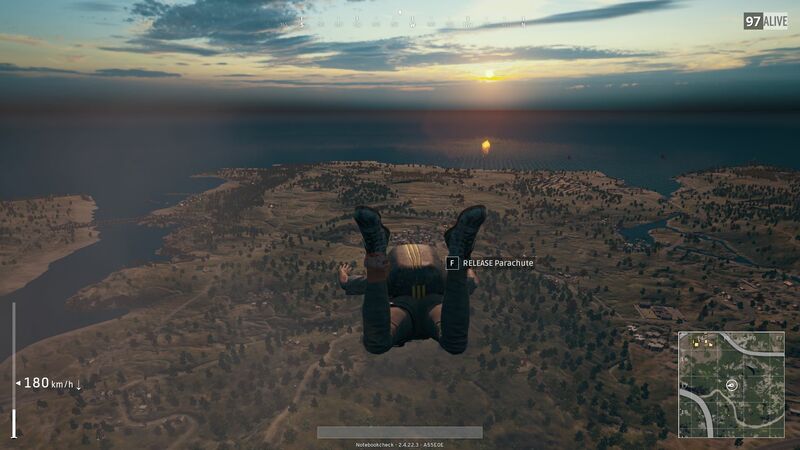 Since we want to test PUBG on future laptops, it would take too much time to wait 60 seconds for the game to launch and to jump on a predefined point via parachute in the long run. 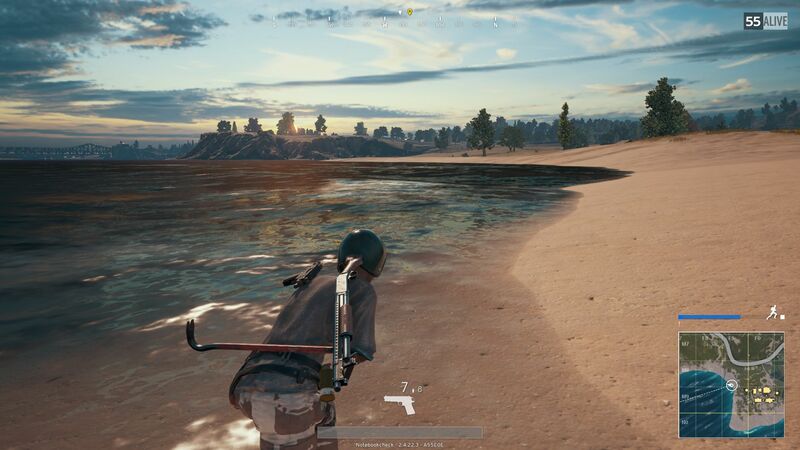 Thus, we limit ourselves to the mini-island where all players are thrown on for getting to know each other either peacefully or brutally. 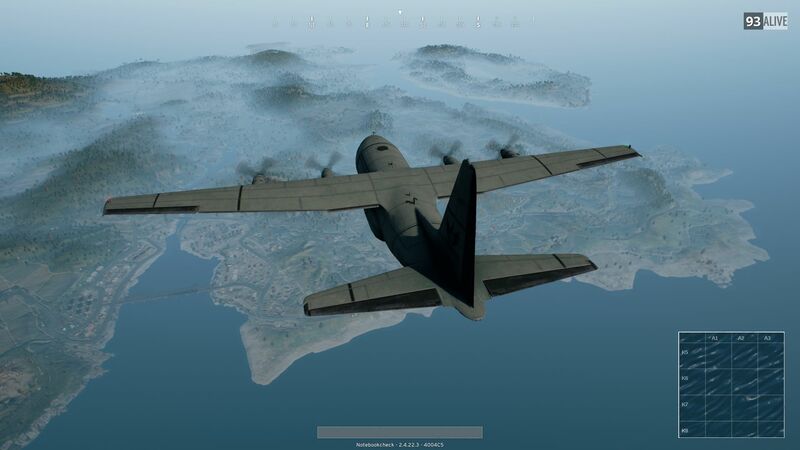 We first run from the spawn point to the tail of the crashed plane and wait there until all textures are loaded correctly. As soon as the graphics are completed, we record a 20 - 30 second sprint to the nearby bunker with the tool Fraps. 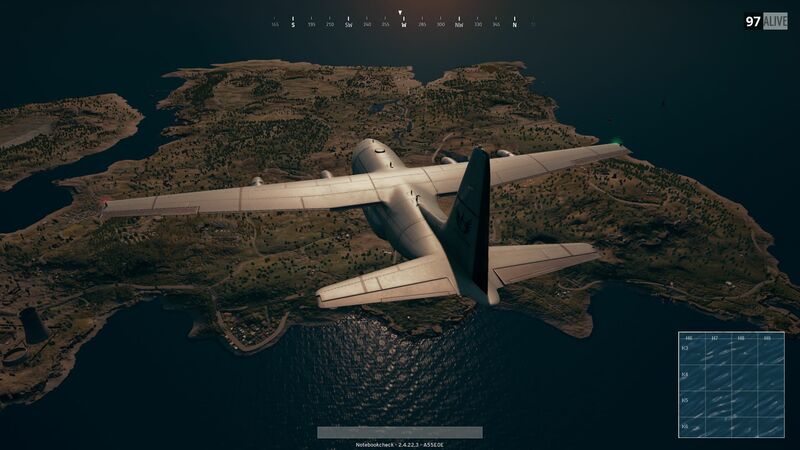 According to our comparison tests with a GeForce GTX 1080, this roughly corresponds to the average performance of a normal mission (compare diagrams). 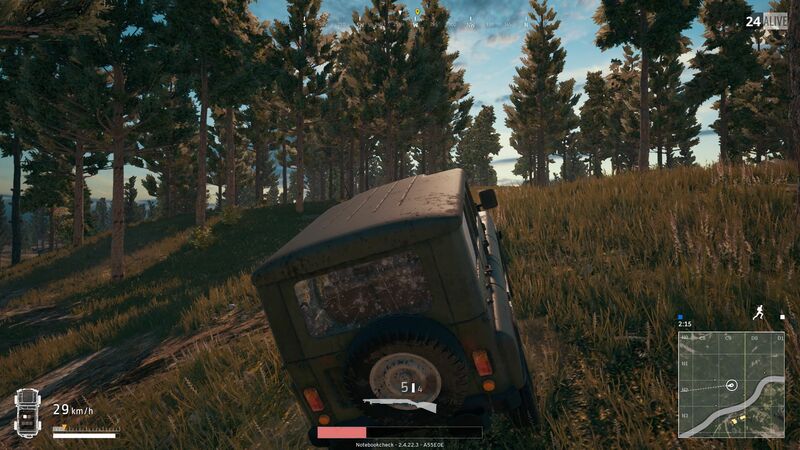 Although the benchmark route is identical in every test, certain frame rate deviations cannot be excluded. +/- 5 is the order of the day from one run to the next. 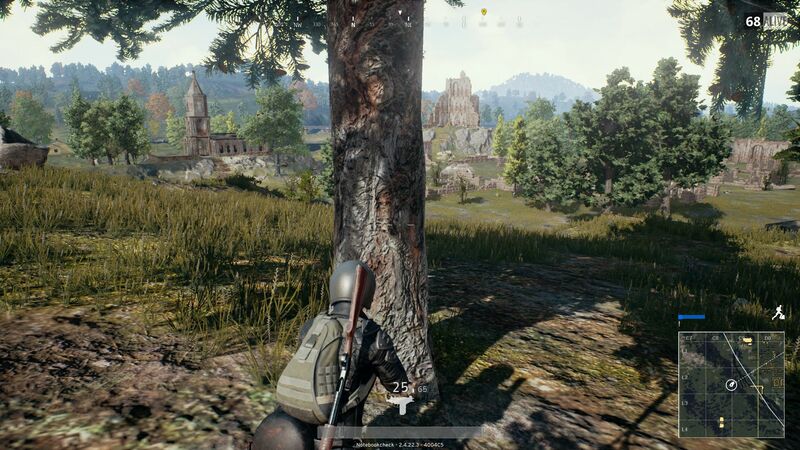 However, the highest peaks are found in minimum FPS. The benchmark sequence in the lower video can be used for performing own measurements. Our results are based on the game version 2.4.22 from July 2017. 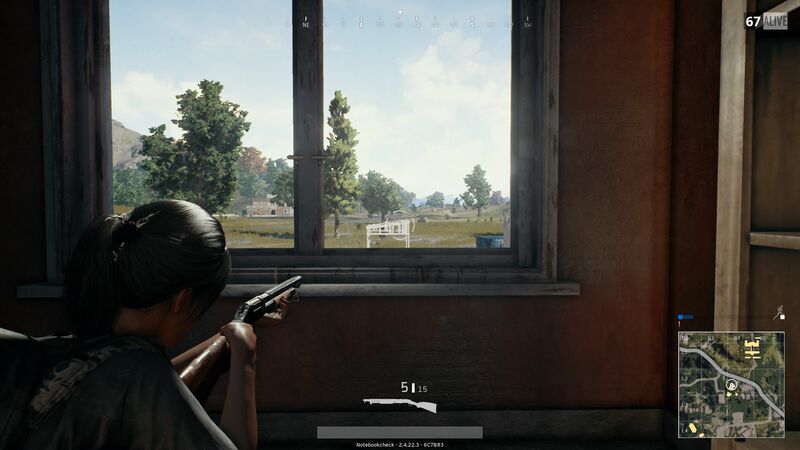 Since it is a competitive multiplayer shooter, a high frame rate is more important here than in other games from the action genre. 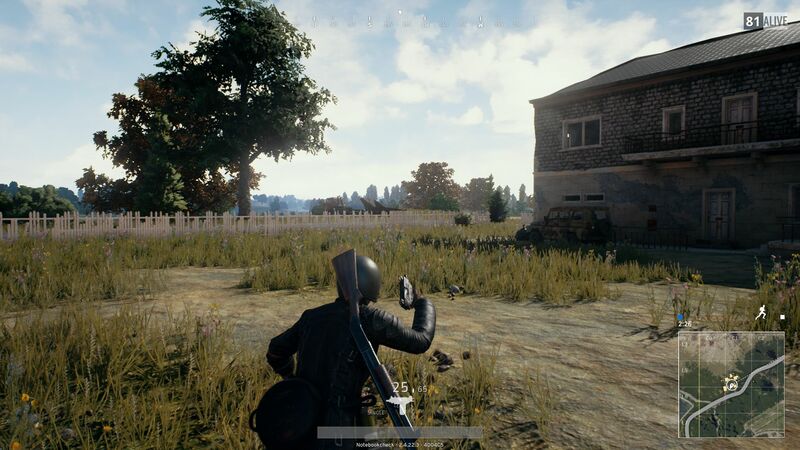 An average of at least 50 - 60 FPS is needed for a decent gaming experience and as a reserve for the occasional performance losses. While low-end GPUs, such as the GeForce 920M, are overloaded in all settings and resolutions, chips from the lower mid-range (GeForce GTX 950M, GeForce MX150, etc.) manage at least 1280x720 to 1366x768 pixels and minimum to medium details. 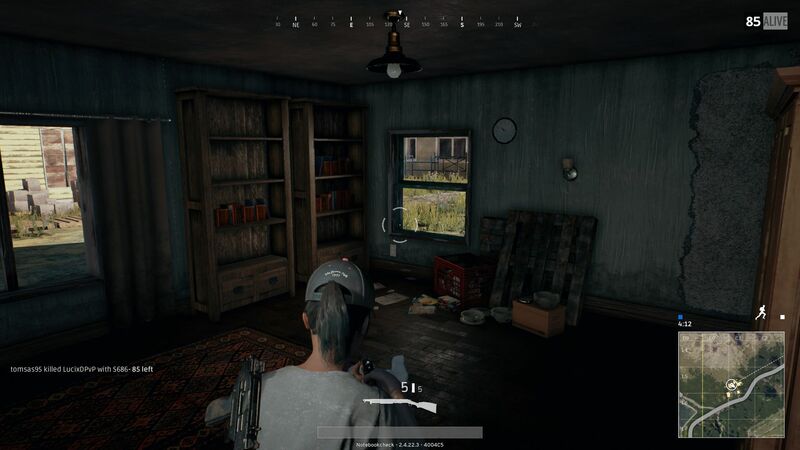 A genuine gaming unit is needed for resolutions starting at 1920x1080 pixels. 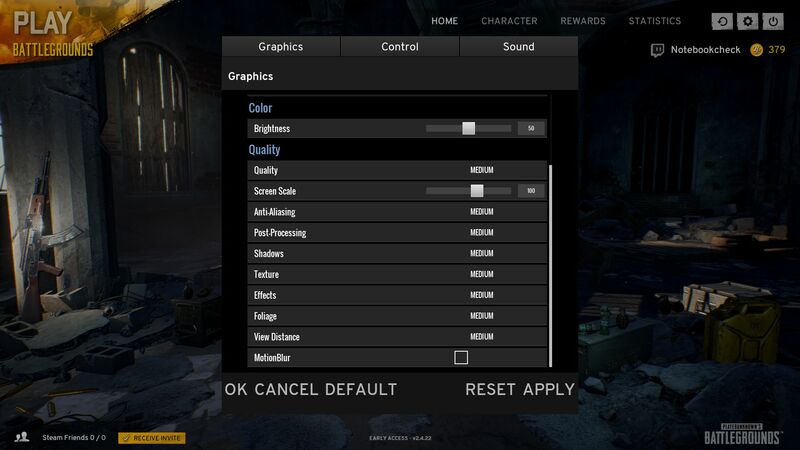 A GeForce GTX 1050 Ti is the minimum recommendation for the medium preset, and a GeForce GTX 1060 or GTX 980 are the minimum for high and ultra presets. It gets particularly tricky in the 4K sector. A mix of 3840x2160 pixels and maximum details is even too much for exorbitantly priced premium laptops with a GeForce GTX 1070 or GTX 1080. The latter settings also bring the GeForce GTX 1080 Ti desktop model to its limits.